A bronze anniversary gift is traditionally for your 8th anniversary, but also for your 19th wedding anniversary gift. This is where having two anniversary lists can get a bit confusing! Bronze is a metal alloy, which means that it is a mixture of other metals to make it stronger, which makes it a great symbol for marriage. Modern bronze is mainly a mixture of copper and tin. A traditional mix of your 7th anniversary, copper and your 10th anniversary tin. Your past and your future mixed together! Even if you don't think of the meaning behind the use of bronze for your 8th and 19th anniversaries there are still some fantastic bronze gifts. 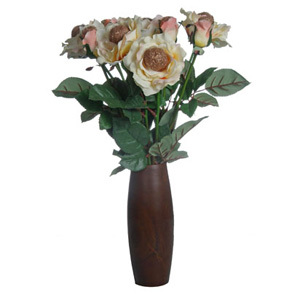 Bronze roses would be a lovely way to remember your 8th anniversary. You could send a single rose or a whole bouquet. These gorgeous roses are available from Just Paper Roses. 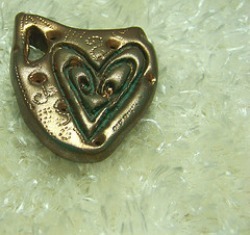 There are lots of stunning, handcrafted bronze jewelry pieces that you are bound to find the perfect anniversary gift. 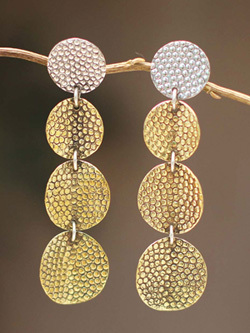 From modern to more traditional, mixed with other metals and precious stones or beautiful just by itself. This is a gift that will last forever. Here are some lovely bronze gifts to help you find the perfect anniversary gift for you. There are some stunning bronze sculptures but they will be expensive, if you have the money then it would be a wonderful way to remember your 8th wedding anniversary. Bronze coins are another bronze anniversary gift, you could go for a classic Roman coin or fill a jar with small coins! We did this last Christmas and were amazed at how much we had when the jar was full. If you don't have the time before your anniversary then go along to your bank and exchange your money for bags of bronze coins. They weigh loads so make sure you have a strong bag with you! The color bronze is also found in flowers and popular choices would be chrysanthemums (also the 13th anniversary flower) and lillies (20th anniversary flower). It is said that if a petal from a chrysanthemum is placed at the bottom of a wine glass it is represents a long and healthy life. Whether you are meant to pour any wine into the glass we can't find out! Your anniversary flower for your 8th anniversary is the Clematis.